You’ve probably heard Murphy’s Law: Whatever can go wrong, will go wrong. As a working professional, I live and die by Murphy’s wisdom. That’s why I always take my gig bag stocked full of everything I think I may ever need on a gig. And I strongly suggest you do the same. To help, I’ve put together a list of must-haves to get you started. Then I added some things that you should consider if you plan on making music your livelihood. Strings – at least two sets per bass. There’s nothing worse than putting your last E string on your bass, only to have it snap two minutes later because the burr on your saddle is still there. Years ago, I saw this very thing happen to Scott Ambush (of Spyro Gyra fame). He broke two strings in two songs, but he had spares, so the show could go on. Later, on a break, he smoothed down the offending string saddle, which had developed a rough spot. Batteries – two for each requirement, at least. I buy several dozen at a time so I never run out. Even if your stomp boxes run on a power brick, it doesn’t hurt to have a few handy in case the brick fails. Cords – guitar, speaker and power. Keep lots on hand. I keep a cord in each bass case or gig bag, and a speaker cord (or two) and a power cord with each amp rack. In addition, I have several spares in my gig bag. Strap – any inexpensive strap will do. Just have a spare, ok? Or do you want to run the risk of playing the last set on a bar stool? Screws, nuts, bolts, and more – All but one of my basses use Straplocks, so I like to keep a few extras around for when I lose a part for no apparent reason. It’s also a good idea to keep handy a few of each screw, nut or bolt that holds things together. Tubes and fuses – If you’re using a hybrid bass amp that has a tube in the front end (Eden or SWR, e.g. ), keep a few on hand in case it gets rattled in transport. Also, eventually, any tube will wear out. If it happens in the middle of a gig or recording session, it doesn’t take that long to replace it. Buy your fuses by the box and order more when you’re down to two of any particular value. If you blow two fuses in rapid succession, have your amp looked at by a qualified technician to find out why. Of course, if you have an all-tube rig, you should have at least one full set of replacements. If you’ll be away from home more than one day, take two full sets. At this point, some of you may be thinking about that multi-tool or some such. Yes, they’ll do in a pinch, but I’d rather have full-size tools for certain jobs, because they’re easier to handle. More on this in a minute. Gaffer’s Tape – Most people use duct tape – or Duck Tape, if you like to mangle the language. Gaffer’s tape is easier to remove (in most applications) and is available in black, which helps hide it when taping down cords on-stage. Like it’s silver-gray brother, there are at least eleventy-twelve uses for Gaffer’s Tape, so don’t leave home without it. Flashlight – There’s nothing worse than trying to work in the dark. And if you’ve been at this for more than a minute, you know how bad back-stage lighting can be when trying to fix something or when trying to find some little part that just fell off your rack. I have a small Maglite handy at every gig. I also have a cool headlamp I got at a camping store. This ingenious device lets me use both hands when working and automatically points the light where I’m looking. One note: please don’t wear the thing on-stage; it’s not nearly as cool as you think. Writing Materials – I keep a notebook and a black Sharpie® marker handy for those times when I need to write a quick chart, whether for a special guest sitting in, or to snag a nice tip from an audience member who just had to hear their favorite song. Testing Devices – It never hurts to have a AC circuit tester to plug into the electrical outlet to make sure you’re getting decent power. Get the type with three lights so you’ll know what the specific problem is. Likewise, it’s a good idea to have a cable tester handy. For those who are more technically-minded, a multi-meter doesn’t hurt, either. First Aid Kit – At the very least, have some pain reliever (your choice), antiseptic goo and adhesive bandages on hand. You can also add Liquid Skin® and a pair of nail clippers (with file). In addition, I carry a towel and a bar of soap in case the bathroom has neither. Cologne is entirely optional but a toothbrush and paste aren’t bad ideas. Something for Everything – The last thing you need to do is decide how to organize your spares and tools, and where to keep them. My main amp and first spare both live in padded bags. I keep two power cords and three speaker cables with my main amp. I keep two of each with my back-up. My small pedal board lives in a lightweight road case, along with a short extension cord, a 4-pack electrical box with 10 ft. tail, and a microphone bag (they’re great for storing small stuff) to hold a batch of AA batteries for my wireless. My transmitter has its own small, shock resistant case. Check out the following video to see how I pack it all in there. To carry all the rest I’ve recently switched over to pair of bags, plus a small, plastic storage box with a handle on the lid. 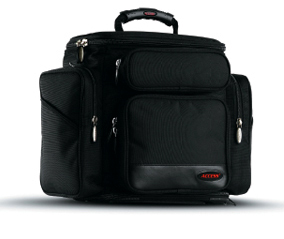 My main bag is the PFX1 from Access Bags & Cases, which is awesome! I’ve opened the inside up to create a large space for my pair of micro-amps, which are my last line of defense. I keep a soft microphone bag for holding tools in the bottom compartment, along with spare speaker cables, another instrument cable, and a spare power strip. One front pocket holds my main battery inventory (dozens of AAs, and a dozen more 9-volts. The other holds a flashlight and a head-lamp (an idea I got from campers). The side pockets hold more strings, a mic bag of “Stage Two” tools, lots more ear plugs, a cable tester, and a couple of pens. My final safety net is comprised of the second bag – a small single compartment unit, and the storage box. Here is where I store my 25-ft. extension cord, more speaker, power and instrument cables, and the rest of my tools, most of which are kept in small zip bags. Boxes protect the fuses, tubes and diaphragms; several more sets of strings are kept together with a large rubber band. The box also holds a spare strap and a final stash of batteries. Building Your Inventory – For those just starting to play out and those who don’t play all the time, this list may seem a bit extravagant. And, to a point, it is. But even those who jam with friends for fun should have a spare cable or two, some strings and a set of basic tools. Doing so will help avoid most problems you’re likely to encounter. Regardless of all of that, you don’t have to run out and immediately buy the whole list; do it a little at a time. Get your entire rig together, including any tools and such that you already have. Then make a list of what you want to buy. Prioritize your list and buy the most important things first. Then, as time goes by, you can continue to purchase one or two items at a time until you have a complete gig bag. You could even put some of the items on your Wish List for others to buy you as Birthday and holiday gifts.